In this short guide I teach you how to develop a simple yet highly effective fueling plan for your long run workouts and races. 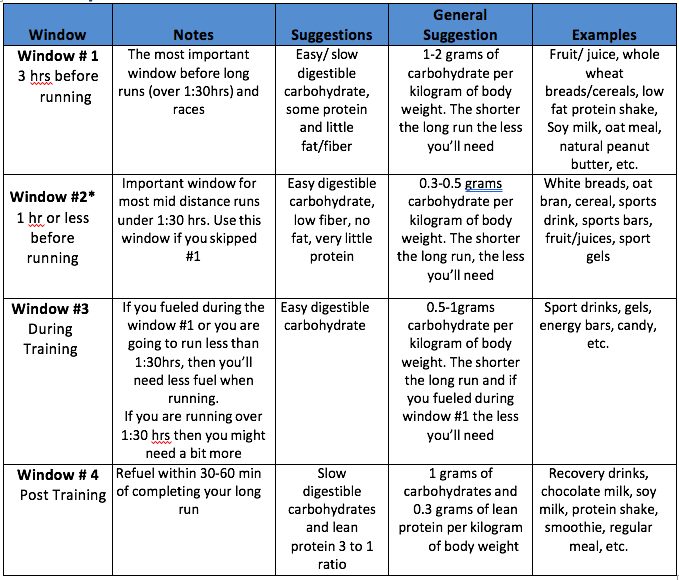 You can use it as a starting point to develop your fueling plan and tweak as your test it during your long runs. 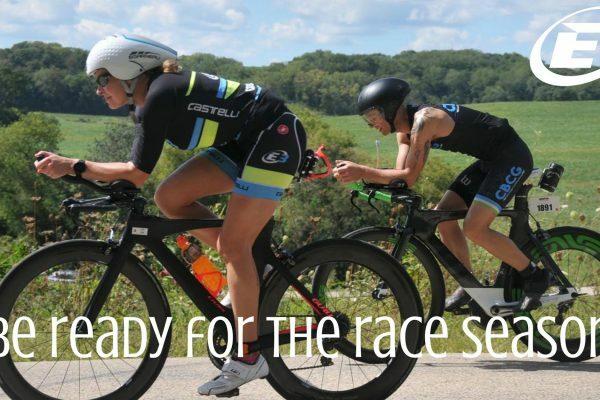 Whether you are training for your next marathon or Ironman, these simple rules apply the same! Eat easy digestible low glycemic index carbohydrates (GI <55), low fiber, low non-saturated fat and little bit protein. You want to make sure your muscle glycogen and liver glucose is top off and that your body is ready to go. The earlier before your long run you eat, the more time your body will have to digest and absorb the food ingested making it available to be used for fuel. If you still have food in your stomach by the time you start exercise, the digestion process will slow down as blood is diverted from the gut to working muscles. Some foods you can eat are: fruit, fruit juice, low fat yogurt, low fat protein shake, eggs (omelet, boiled, etc. ), whole grains: bread/cereal, oatmeal, etc. Be careful consuming foods with high fat content and too much fiber as it might cause among other things gastrointestinal issues. Simple recommendation – convert your weight to kilograms and consume between 1-2 times your weight in carbs and around 20% of that in protein. The shorter the run, the less carbs and the long the run, the more carbs you’ll need! Eat easy digestible moderate glycemic index carbohydrates (GI <55 – 85), no fiber, no fat and very little protein. This window is important to prevent hunger and indigestion before exercise. To prevent hunger, consume sports drinks, energy bars, gels, etc. or natural food like fruit juice, natural smoothie or fruit and/or low fat/fiber crackers, bread, etc. Avoid high fiber food as it slows down digestions and high in fat content as food as it takes longer to get digest it. Also, be careful consuming any of this 30 min before you start exercise. Some people experience “rebound hypoglecymia”, a result from consuming simple carbohydrates triggering a rise in insulin to reduce levels of blood sugar. Since exercise also reduces it, this might make some athletes feel dizzy, weak and experience nausea. If you don’t have much time to fuel before your long run, it is better to consume some fruit juice 5-10 min before exercise and fuel more thoroughly through your run. Simple recommendation – convert your weight to kilograms and consume around ½ your weight in carbs. *Only use this window if you didn’t have the opportunity to fuel properly 2+ hrs before training otherwise just consumes some sport drink and/or a gel and water. Consume primarily high glycemic carbohydrates easy digestively such as sports drinks, sport gels, etc. Research suggests your body can absorb around 1-2 grams of carbohydrates per minute which translates to around 60-120 grams of carbohydrates per hour, particularly of you consume a 2:1 ratio of glucose to fructose (i.e. ½ scoop of Levelen Sports Drink = 25 grams of Carbohydrates). How much you need will depend on whether you fueled properly before the long run, and based on your weight, fitness level, outside temperature, etc. In other words, don’t fuel more than you need. Use your long training runs to experiment to see what works for you, but probably consuming more than ~60 grams of carbohydrate per hour may cause gastrointestinal issues unless you have trained to consume more. Some food you can consume: sports drinks, sports gels, sports bars, candy, fruit, fruit juice, dried fruit, water, flat soda etc. make sure to consume any solid food with water as a high concentration of carbohydrates might lead to exercise related transient abdominal pain (ETAP) commonly known as “side stich”. 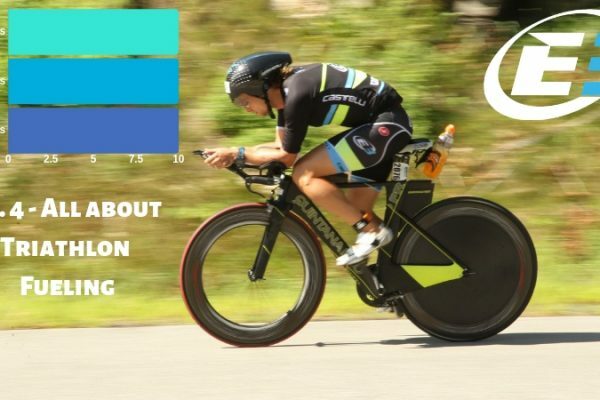 Most sports drinks have a concentration between 6 and 9 percent, so if you fuel using that you should be fine, but if you consume something like sports bars, then drinks some water. If you didn’t have the opportunity to fuel during the 2-3 hour window, then consume extra 5-10 grams of carbohydrates, but dilute by consuming plenty of with water. Within 30-60 minutes of completing your long run, you should take a recovery drink of food on a ratio of 3:1 carbohydrates to protein. Evidence has been shown this can help your body restock muscle glycogen faster as well as speed up the muscle repair process with protein. Consume 1 gram of carbohydrate per Kilogram of body weight and around 20-40gr of protein total. 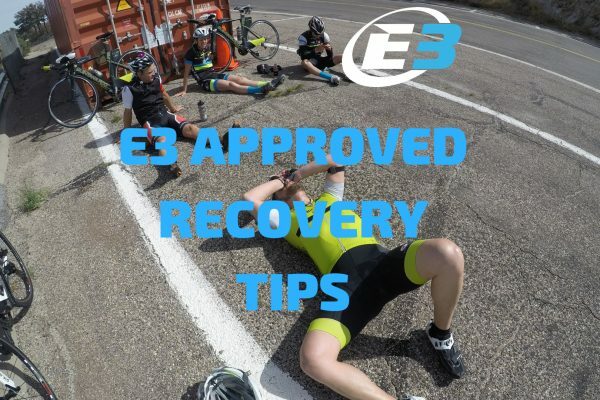 Within 2-3 hrs of completing your long run, you should consume a recovery meal with food on a ratio of 3:1 carbohydrates to protein and replenish electrolytes. Choose nutrient dense whole foods, like whole grains, lean protein and non-saturated fat. Simple recommendation – Consume 1-2 times your body weight (in kilograms) for carbohydrates, and a quarter of that in lean protein and non-saturated fat; also add electrolytes (sodium, potassium, calcium, etc.) Stuff like whole grains, vegetables, fruit, lean protein and ‘good’ fat.